Rockdale Branch President, Jim Morse, began his banking career in a small-town community bank in Brownfield, Texas. A graduate of Texas Tech University with a degree in Finance, Morse extended his education at the Graduate School of Banking at Colorado where he graduated with honors. Jim is a 3rd generation banker who abides by the philosophy that we should treat others as we would want to be treated. 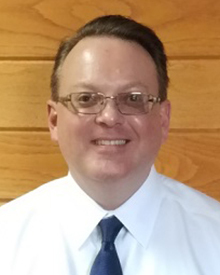 His professional experience includes serving in senior management as Chief Credit officer at a community bank in West Texas. Most recently, Morse utilized his perspective and expertise in the banking needs of business owners to open a surgery center from the ground up for two Ft. Worth doctors. Jim also earned a spot on the prestigious “40 Under 40” list named by the Ft. Worth Business Press. A community man, Morse has served as President of the Optimist Club and also as Treasurer and VP of his local Chamber of Commerce. While the big city can be engaging, Jim is very excited about returning to small town community banking. Settling in with his wife of over 20 years, two children, 2 cats and 2 rescued dogs, Jim is at home in Rockdale and is looking forward being of help as a supportive asset in our community. In his leisure time, Morse enjoys watching super hero movies with his family, playing Minecraft with his kids and watching Downton Abbey with his wife. An avid reader, he’s “become a student of the classics” taking-on an original 54-volume set of Encyclopedia Britannica handed down to him from his in-laws. At his core, Jim abides by the belief that whatever one does, it should be done as working for the Lord. With his sense of dutiful purpose and goodwill, we look forward to seeing the great ways he will help shape the continued success of Rockdale.